Meagan has always shown a passion for the outdoors from playing in the mud to catching anoles and toads throughout her childhood; however, she did not realize her childhood passion could become a reality until she had the opportunity to go on a summer internship. In 2014 her internship took her to the Appalachian Mountains where she studied reptile and amphibian populations. In May of 2015, she received a Bachelor’s degree in Biology from the University of Texas at San Antonio. Continuing her newfound passion, Meagan worked at Texas Parks and Wildlife as a natural resource management and education intern. In August 2017, she finished a Masters in Wildlife Ecology and Management at Texas State University. Her thesis focused on the ecological requirements of the Gulf Coast kangaroo rat, a small rodent found in south Texas. 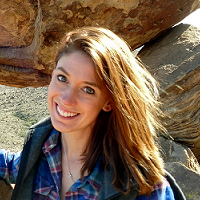 As a newly minted graduate student and Weekend Manager/Natural Science Educator at Westcave, Meagan is ecstatic to share her passion for the outdoors and make nature come alive for all Westcave visitors.